Before leaving on our Uniworld River cruise, my husband thought it would be best to settle in and get over jet lag before I had to get camera ready for our filming days ahead. So we arrived in Prague, capital of the Czech Republic, 2 days in advance of our scheduled time with the cruise line. This was November and although I wasn’t looking forward to cold weather, I was prepared with boots, wool coat and gloves. Happily, the day we arrived the weather was a really nice 50 something degrees and the sun was attempting to shine. 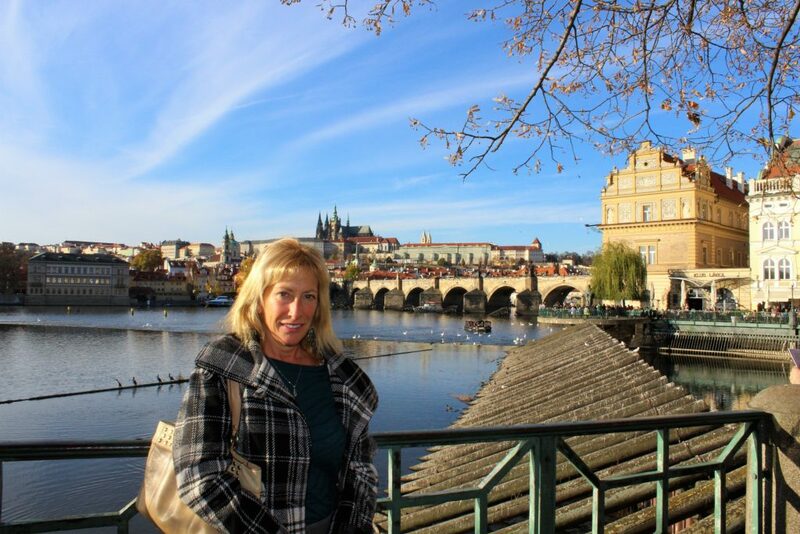 I had been to Prague once before, many years ago, and so I was anxious to see what I would remember and what had changed. We walked down the pretty cobblestoned streets to the 12th Century Old Town Square where one of the world’s oldest working astronomical clocks is located. We happened to be there just as the clock did its hourly mechanical show of the 12 apostles. Woohoo! As we continued to the famous Charles Bridge, I was astonished at the crowds of people everywhere even at this time of year. We wound our way around the sloped streets below the Prague castle and found a beautiful spot above the town’s oldest vineyard to have a drink and take in the magnificent views surrounding us. Our first day of filming began in the hotel itself, where Vladimir from Praguefoodies.com met us in the lobby to eat at the beautiful Cafe Imperial. This stunning art nouveau restaurant is an elegant and popular grand cafe that dates back 100 years. The Chef, Zdenek Pohlreich, owns and runs 4 restaurants and is also a big tv personality in the Czech Republic. I got to sit down with him and talk to him about his very busy life while enjoying his most delicious signature, a braised lamb dish that cooks for 6 hours and comes out so tender. Can you believe he serves 1,000 plates a day at this restaurant! Vladimir was excited that I agreed to venture out of town, this time to a suburban residential neighborhood and a restaurant called Story. There I met the humble owner and Chef, Michal Cerny who was meticulously preparing my meal with the freshest and specially chosen ingredients. I was impressed to hear that the young owner creates and prepares every single dish that leaves his kitchen. I asked why he chose this unassuming space and he said that good food was needed outside of the city center too. If you visit Prague, it’s definitely a trip worth making. That night after a short rest, we visited one of Prague’s newer microbreweries, Vinohradsky Pivovar, located in the Vinohrady neighborhood a short distance from the city center. The owners were intent on producing excellent beer and ales and their space is ideal – 100 years ago it once was a fermentation cellar for beer! They also serve some incredible Czech dishes to accompany the beer and I munched on some super tasty venison and duck. trying absinthe and even given a lesson in the proper method of serving the green liquor. (I actually loved it!) Somehow we all managed to stumble our way back to the hotel. 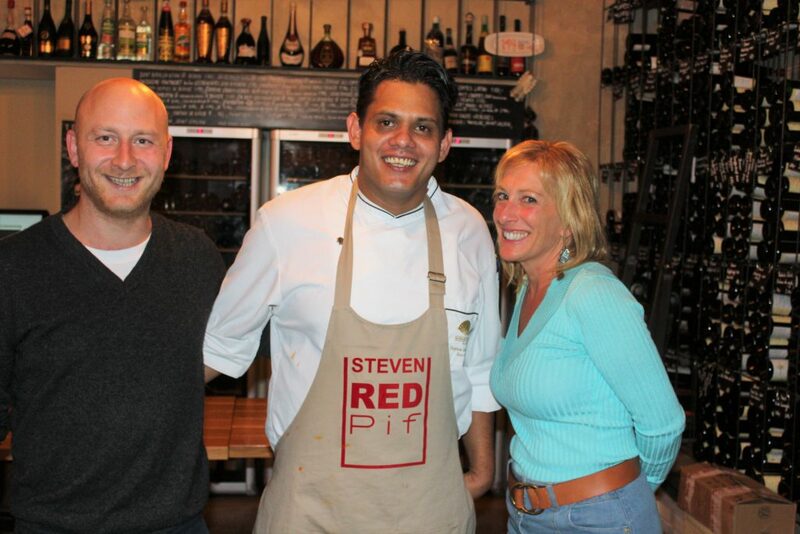 Our final stop was back to Red Pif, this time to cook with the Chef, Stephen Senewiratne. I was given a personalized apron that they had made for me (how thoughtful was that?) and followed the Chef into his kitchen. Being from Sri Lanka he loves to create new flavorful dishes, so he experiments a lot with his food. He told me he’d be making me a bunch of dishes that could be paired with wine. The restaurant is known for their incredible selection of natural wines (no pesticides, sulfites etc. ), all made from boutique, independent winemakers. 5 dishes and 5 glasses of wine later, the night was over and my time in Prague was done. To think this was just the beginning of this European food odyssey. Tomorrow it’s off to Nuremberg, Germany.